How Challenging Is It to Travel in Italy? Before you begin working your way to foreign language fluency, it helps to understand the culture behind the language you’re learning. After all, language exists to help a group of people express their ideas and beliefs. Italy is an old country with a rich history and culture. 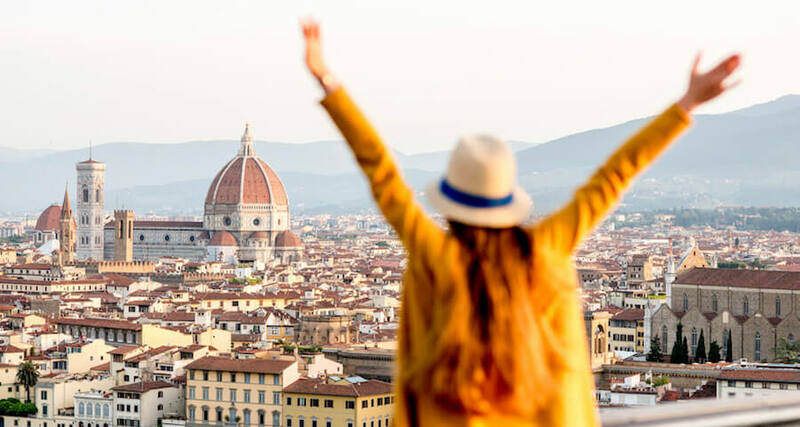 As you begin your Italian language program, gaining a strong grasp on this history, the values, and the etiquette will help you rapidly achieve success. In particular, it’s helpful to know what to expect when traveling in Italy so you can arrive comfortably on time at your destination. Getting around once in Italy is affordable, if not always dependable. While there are public and private transportation options, private companies operate mainly outside the big cities, providing local access in and around towns and villages. However, while the schedule seems promising, it is susceptible to frequent delays and interruptions. Strikes are common, bringing state-run train service to a standstill. On a positive note, the strikes are generally announced with advanced warning. Planning ahead and reserving seats is recommended. Monitoring information from the rail operator in advance of travel is also advisable in case a strike is announced. Even if there is no strike, the train system is prone to delays and somewhat unpredictable timelines. The rail system is called the “ferrovia statale.” The website, www.trenitalia.com, has its homepage in English, and contains the timetables and schedules. Tickets can be purchased at the station or in advance online or through a travel agency. There are unlimited travel tickets that come in varying lengths of time. For non-residents, there is the Italy Rail Card, which comes in flexible lengths up to thirty days. The Flexi-card can be purchased for four, eight, or twelve days. Basic rail service is available station to station, as well and is priced accordingly. For transportation within the major cities, there are networks of metro trains, buses, and trams. Several cities have subway trains, called the“metropolitan.” Tickets for the “metropolitan” are purchased at the same “tabaccherie” that sell “bolli” and lottery tickets. There are no ticket sales on the trains themselves, so purchase in advance. There are machines at the stations, and in most cases the tickets are good for a length of time. In Milan and Rome, these flat tickets are good for 75 minutes, while in Genoa, they are good for 90 minutes. In most cities, the same ticket allows transfer between the metro trains and the buses. There are also tickets that are good for the whole day or for a whole week. The “metro” is the fastest way to get around congested areas, such as the tourist center of Rome. The trains are generally efficient, arrive every several minutes, and serve much of the area where tourists are most interested in visiting. The lines do not always reach as far as the local airports. However, as in Rome for example, there are generally large transfer points to connect the state train lines to the subway system. “Who has been to Italy can forget all other regions,” proclaimed nineteenth-century Russian author Nikolai Gogol in a letter to his poet friend Vasily Zhukovsky. “Europe compared to Italy is like a gloomy day compared to a day of sunshine.” A romantic sentiment, but admiring Italy and actually getting around Italy are entirely different matters. Fortunately, modes of travel in Italy have improved a lot since the days of the Grand Tour, but that does not mean that it is a simple task. Italian transport systems can be untimely and uncertain; for this reason, an essential quality of a great travel itinerary is flexibility. For a longer stay or for traveling beyond Italy, a Europe rail pass is a worthwhile and surefire way to navigate between cities quickly. Why Is German Communication so Concise?